A US daredevil has recreated a stunt he first performed 30 years ago by setting himself alight and diving into a river. 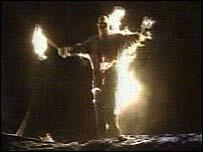 Ted Batchelor, 47, set fire to his flame-retardant suit for about a minute, before jumping off a platform into the Chagrin Falls in Ohio. The stunt was carried out with official blessing - unlike the original effort. Mr Batchelor first set himself ablaze and jumped into the river near the city of Cleveland in 1976, to earn money from a student bet. He repeated the stunt every year in the late 1970s and early 1980s. Crowds would gather, take pictures of the diving human fireball and boo as police took him to jail. Mr Batchelor told the Associated Press news agency that friendly officers eventually became part of the act. "They'd ask me, 'You want the handcuffs on or not?' I'd say, 'Yeah, gimme the handcuffs. It looks good'." Usually, friends bailed him out the same evening. But Mr Batchelor spent four days in jail in 1984, and the next year he was fined and put on two years' probation. "That's when I stopped," he said. Mr Batchelor still sets himself on fire and gets paid to do it - mainly for local events and television adverts.